We are one of the leading manufacturers of infrared equipments and heating elements. Our Infrared equipments are made with latest technology and research to provide best quality for our customers. Our Ceramic Infrared Heaters are designed to produce maximum output in form of heat energy. They are constructed by a firmly burnt-in heating coil. The heater incorporates highly heatproof resistance wire that provides safety against much damage. We supply Custom Wattage Ceramic Infrared Heaters as per the requirement of our clients. Longer service life is achieved since the resistance of the heaters is made to remain constant over the whole temperature range. The glaze used in this heater has excellent radiation properties therefore the radiation efficiency is also very high. This heater is available with Color Changing Feature as Yellow Ceramic IR Heater (CC FSR). • The material used for the production do not oxidize therefore the surface always remains clean and do not wear out. 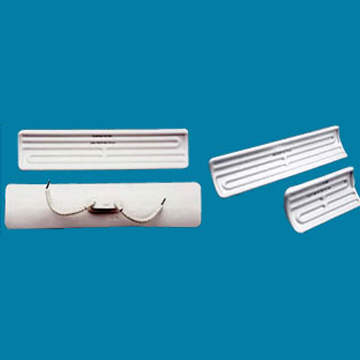 • As the coil is embedded in ceramic material, it can be installed in any possible position.